In every modern vehicle there are miles upon miles of electrical car wiring, tying together systems comprised of control modules, switches, motors, resistors, fuses, sensors and more. No matter what kind of vehicle you drive, it’s very likely you’ll experience some sort of electrical problem over the life of your car. It could be an annoying electrical gremlin in the car wiring, an intermittent window switch, or a starting or charging system that isn’t operating properly. Whatever the symptom, you can rely on the expert automotive electrical service at New Concept Auto Service in Overland Park. With 30 years in the business, our professional team will accurately diagnose and perform automotive electrical service on most makes– while providing you the fine customer experience you deserve. 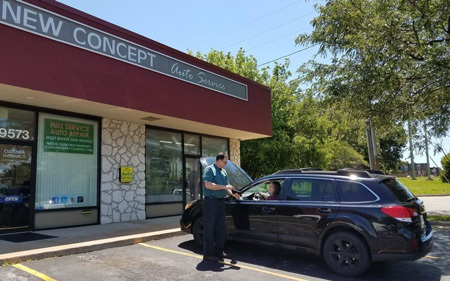 At New Concept Auto Service, we have three ASE-certified master technicians who will precisely identify and repair any electrical concern your vehicle may exhibit. We use professional-grade tools including digital volt-ohm meters, battery and charging system testers, and dealer-level computerized equipment. All of this helps us ensure an accurate and efficient diagnosis. From window motor issues on your VW Jetta, to wheel sensor wiring harness problems on your Chevy Malibu, we always use high-quality aftermarket or original equipment parts. This way your automotive electrical system will last as long as possible. If all your vehicle requires is a simple wiring harness or fuse replacement, we’ll do just that— instead of needlessly replacing an expensive component. Honest. Accurate. New Concept. Call us or use our online appointment form to schedule your automotive electrical service today! At New Concept Auto Service, you can rest assured that an ASE-certified technician is working on your auto electrical service. We have the expertise and training to repair any concern that pops up, from fluid leaks to worn out parts. We perform auto electrical services on all domestic and import models, regardless of the vehicle’s age. We have the necessary diagnostic tools and the repair technology to efficiently and accurately perform your auto electrical service right the first time. It can be inconvenient trying to coordinate your auto electrical services around your school classes or work, so we work around your schedule to make your visit as hassle-free as possible.